The legend of Shakespeare's Motley Crew began like an MGM movie-a group of artists met in a class on "Acting Shakespeare" at the Newberry Library in 1991 and promptly declared, "Hey, this is fun! Let's put on a show!" The resemblance stopped there, however. No fathers in possession of surplus lumber for scenery, mothers to sew costumes or convenient 1500-seat barns emerged to provide a pretext for elaborate musical extravaganzas. After a decade of generating copious critical praise, but little in the way of profit, the founders of SMC mothballed its tents and migrated west to try their luck in the land of sunshine and automobile fumes. When those pastures proved no greener, the prodigals returned home to Chicago with passion undiminished but hardly a splinter to their names. By 2012, though, the call to the stage once again beckoned. "I had always wanted to start a theater program in Winnemac Park." Macknin explains, "Ravenswood is my neighborhood, after all, and I'm a huge fan of outdoor theater, so this seemed like the right time to get everybody—the parks, Amundsen High School and our aldermen O'Conner and Pewar—excited about Shakespeare." How did the concept of doing a Shakespeare revue, as opposed to a single play, come about? "Necessity! " recalls Macknin, "That first year, the park district didn't give us approval until June—to open a show in August! Since there wasn't time to prepare a full production, what we wound up assembling was an evening of 'Shakespeare's greatest hits' that we dubbed Midsummer Mayhem. It was a casual affair—family-friendly (no bawdy jokes), loads of slapstick fights and interacting with audience." Just how motley is the crew? Are specific artists assigned specific tasks? "We all wear many hats. Roz [Francis] and I typically decide what goes into the script, Sid [Parker] usually directs and Maia [Rosenfeld] does a million other things. We also have an in-house stage manager, costumer and fight designer." 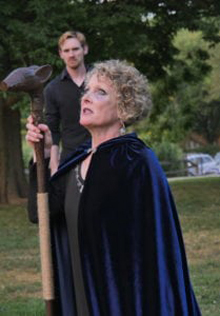 The Midsummer Mayhem series is now in its sixth year, its 2018 program subtitled The Prophesies and featuring prognoses from Macbeth, Lear, and many more. What can we expect from SMC in the future? "We are working to schedule a year-round season—or at least a winter and spring holiday spectacle—of chamber-style 'bite-sized' Shakespeare in libraries and churches in addition to our pageants in the park." Can anyone join? Macknin smiles, "We're not really an ensemble, but everyone who works with us is invited back—and we do hold auditions." 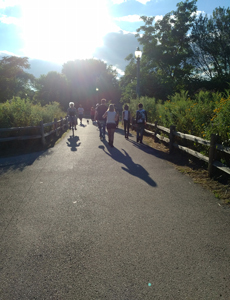 Midsummer Mayhem: The Prophesies runs at Winnemac Park weekends through August 26.